Pera Sa Kweba SMS Promo ~ Philippine Freebies, Promos, Contests and MORE! The Puerto Princesa Underground River is known to be the longest passable underground river in the globe. Considered to be a treasure trove of formations of stalactites and stalagmites, it is open for the public to see and experience. 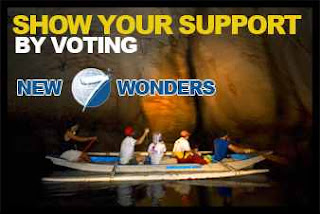 It is the Philippines' official entry and is 1 of the 28 finalists to the Search for the New 7 Wonders of Nature. To support the campaign, the Pera Sa Kweba Text promo was launched in which all telecommunications business unite to promote the PPUR worldwide. To join, register by sending PPUR REG [Name/Complete Address/Age/] to 2861. Download, vote, and earn raffle entries for a chance to win a whopping P25million, P1million, P250,000, P100,000, or P10,000 cash prize.